Mont Blanc is one of the highest and most famous mountains in all of Europe. The mountain itself is situated on the border between France and Italy. It is known as Mont Blanc in France and most of the rest of the world, and Monte Bianco in Italy, with both of these names translating to 'White Mountain' in English. Mont Blanc earned its name due to the huge amount of snow that covers it all-year long. Mont Blanc is situated in the Alps and is the highest mountain in both the Alps and all of Western Europe. It also has the 11th highest prominence of any mountain in the world. The mountain is situated right on the border between the Haute-Savoie region of France and the Aosta Valley part of Italy, with the three nearest towns being Chamonix and Saint-Gervais-les-Bains on the French side and Courmayeur on the Italian side. Mont Blanc was featured in the first ever Winter Olympic games, held in 1924 in the town of Chamonix. The mountain is a highly popular touristic location, with some tourists simply visiting to admire the mountain and surrounding scenery, while others attempt to reach the summit. Popular activities in the area include skiing, snowboarding, hiking, and mountaineering. The first ever successful ascent of Mont Blanc was completed in August of 1786, and many people attempt to reach the top each year. 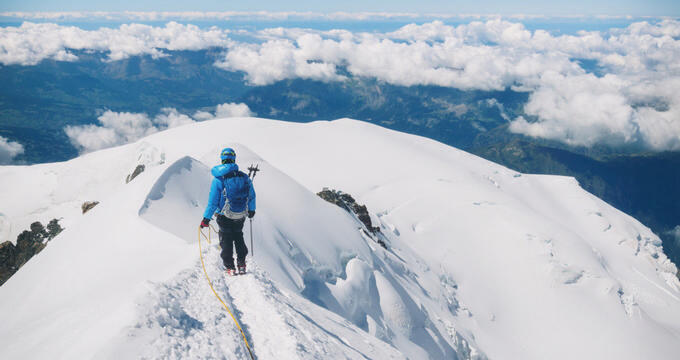 It is, however, a dangerous climb, with many people requiring rescue and around 100 deaths occurring in the Mont Blanc Massif area each year, making Mont Blanc one of the most lethal mountains on Earth. The elevation of a mountain is an important statistic that tells us how high the mountain's summit is in relation to the mean sea level of Earth. Elevation is most commonly measured in feet or meters, and the elevation of a mountain can change over time due to erosion, weathering, or seismic activity. It's important to note the difference between elevation and prominence, with the latter term being used to describe the height of a mountain from the contour line at its base to its highest point. The elevation of Mont Blanc is 15,777 feet (4,808.7 m), while the prominence of Mont Blanc is 15,407 feet (4696 m). The official elevation of Mont Blanc was long given as 15,771 feet (4,807 m), with other readings being established over time, but advances in measuring techniques and technology have established the official height at 15,777 feet (4,808.4 m). Various key locations and huts along the climbing route of Mont Blanc include the Refuge Vallot, which is situated at an elevation of 14,311 feet (4,362 m), the Cosmiques Hut, which is situated at an elevation of 11,854 feet (3,613 m), the Tete Rousse Hut, which is located at an elevation of 10,390 feet (3,167 m), and the Grands Mulets Refuge, which is located at an elevation of 10,007 feet (3,050 m). Mont Blanc is situated in both Italy and France. The average elevation in Italy is 1,765 feet (538 m), while the average elevation in France is measured at 1,230 feet (375 m). The second highest mountain in Italy is Grenzgipfel, which is located in the Monte Rosa Massif at the border between Italy and Switzerland. Grenzgipfel has an elevation of 15,151 feet (4,618 m). The second highest point in France is the Barre des Ecrins, located in the French Alps at an elevation of 13,458 feet (4,102 m). The climate at Mont Blanc and the surrounding Mont Blanc Massif area is cold and temperate, with elevation playing a big part in weather conditions around this location. Areas at higher elevations tend to see lower temperatures and higher chances of precipitation in general. Even near the base of Mont Blanc, in the towns of Chamonix and Courmayeur, which are situated at relatively low elevations, temperatures can get very low throughout the year and over 250 inches of snow can fall through the winter months. As previously mentioned, the climb up to the top of Mont Blanc isn't easy, with many deaths and rescues being reported each year. Various mountain huts and refuges can be found along the route, and the surrounding Mont Blanc Massif region is a very popular tourist area, with more than six million visitors each year. Visitors who prefer not to try climbing the mountain can ride the Aiguille du Midi Cable Car from Chamonix, which offers stunning views of Mont Blanc and the surrounding area as it rises up to an elevation of 12,605 feet (3,842 m).